East Hampton Town is one step closer this month to having its own emergency room. 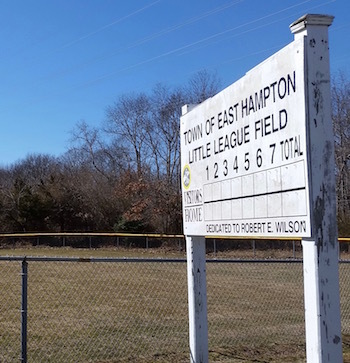 On Jan. 19, the East Hampton Town Board unanimously approved the lease of 4.5 acres on Pantigo Place to the Southampton Hospital Association for the construction of a 27,000-square-foot freestanding emergency department. In exchange, the hospital has agreed to pay for the construction of two new lighted baseball fields elsewhere in town, to replace the existing Little League fields at the site where they’re proposing to build the ER. First responders from the easternmost reaches of the South Fork have long spent hours in traffic, particularly in the gridlocked summer months, when transporting patients to Southampton Hospital, which is more than 26 miles from downtown Montauk. Jay Levine, who lives in Montauk and serves on Stony Brook Southampton Hospital’s board of directors, estimated at an East Hampton Town Board public hearing on the lease Jan. 19 that it would take “at least an hour-and-a-half” for him to arrive at the Southampton hospital if he were to have a stroke and his wife were to call an ambulance. Ambulance personnel often talk about “the golden hour,” the time after a medical incident occurs in which it is crucial that patients are stabilized and transported to the care of a physician. Montauk Fire Department Chief Vincent Franzone said the “golden hour is so important to us. That extra few miles is going to make all the difference in the world,” both for patients and for his 30 volunteer ambulance personnel, who ran 762 calls last year. He said the Amagansett Fire Department also ran about 600 ambulance calls last year. East Hampton Village Mayor Paul Rickenbach said the East Hampton Village Ambulance Association made 1,225 ambulance trips to Stony Brook Southampton Hospital in 2017. “The demand on volunteers and EMT staff should be lessened, so they’ll be back into rotation and able to respond sooner, without having to travel to Southampton,” said Mr. Rickenbach. Stony Brook Southampton Hospital received a $10 million grant last year from New York State to build the emergency room, and will be fundraising to raise the difference between the grant and the facility’s $35 million price tag. The lease would be for 50 years, with one 25-year and one 24-year extension offered after that time. The new emergency room would be adjacent to an existing health care center on Pantigo Place run by the East Hampton Health Care Foundation, which already houses a complex of doctor’s offices. Dr. George Dempsey, whose office is in that complex, said he’s in favor of the emergency room, but he wants to have a community discussion about what the new ER can and can’t do. For example, he said, it took Stony Brook Southampton Hospital years to become a stroke-certified facility, the new ER won’t have cardiac catheterization labs, and he doubts the hospital will be able to have a cardiologist, neurologist or trauma surgeon on staff. Stony Brook Southampton Hospital CEO Robert Chaloner said most ambulance calls are for broken bones, sutures, and other less-serious injuries, which could be handled in-house in the East Hampton facility. He added that people who are well enough to drive to the emergency room on their own would also benefit from having an emergency room closer to home. He added that high-level trauma and open heart surgery patients are currently airlifted to Stony Brook University Hospital’s main campus as is, and that will not change when the East Hampton satellite facility is built. He said the facility would include diagnostic imaging facilities and a pharmacy supplying ER patients with lifesaving medicines, and will be wired with the latest technology allowing doctors working at other locations to weigh in on cases in East Hampton.